It's not everyday that you find someone wearing cashmere, may it be a scarf or any kind of accessory. With this kind of shawl wrapped around your neck, you are able to show a flair for style and high fashion, and a distinction that nobody can easily keep up with. From here you are able to stand out amongst the crowd. This shawl will also serve as your trademark; people will start recognizing you for this accessory, and no longer look at you as another person in the crowd. Cashmere is more than just fashion. While it is known for being soft and used in luxury items, cashmere is also capable of keeping you warm and protecting you against the heat. In fact, cashmere is used for many centuries as a fabric that keeps a person protected against dirt, gust and sand. So yes, it doesn't hurt to wear your cashmere shawl under the hot sun; it's actually a great way to use the fabric effectively. A cashmere shawl compliments every outfit perfectly. You may be wearing something casual or formal, hipster or corporate, but with a shawl of this fabric, you may never go wrong. It's because cashmere has this ability to blend in with the rest of your fashion choices, no matter how eccentric they can get. 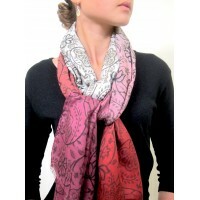 A cashmere shawl is also the right accessory in case you need to perk your style up a bit. You may be wearing denims and cottons in a party, but with this kind of shaw at hand, you can still look posh. Cashmere is easy to clean. It may be delicate, sure, but cashmere is actually low maintenance. All you have to do is soak it in warm water with mild detergent and fabric conditioner, then rinse it clean. You need not sun dry it, as natural air drying would keep it at its best shape. Well, are you deciding between a shawl or a cashmere scarf? If so, then perhaps you should think about where you are going to use the accessory first. A shawl is more convenient when you are more into parties and social events, as these compliment dresses and other themed-outfits. Meanwhile, if you are the more outgoing, corporate or casual type, then a cashmere scarf would be more useful; you can mix and match it with your everyday outfits and look totally stylish all the time.